Do line-marking paints exist that will survive our challenging climates? For the next year, we’re testing line-marking paints, to determine which best weather the tough conditions on BC’s highways. How long will each paint take the scouring of winter abrasives (aka crushed stone and gravel)? Will it stand up under the scraping of snow plow blades, what effect will heavy rain, snow or slush have, and how long will it be before the weight and friction of vehicles dull its shine? We’ll be observing recently painted test lines and collecting data, to gain a better understanding of how the paints perform over their typical life cycle. The competition is on between 18 types of paint near Maple Ridge on Highway 7, Kamloops north of Halston Road on Highway 5, and Prince George on Highway 97. The lines were drawn last month – four-inch wide horizontal strips of white and yellow paint, across one lane of each road. Signs posted there, indicate that testing is underway. Paints have complex chemical formulations. Getting a better understanding of how the paints being tested work is important because we all love nice bright line markings. Highly visible lines make it easy for drivers to see where their vehicle needs to be, and good lane and road edge markings guide traffic and make our roads safer for everyone. Every year, our contractors repaint more than 30,000 line kilometres throughout the province, so the testing could potentially have a widespread effect across BC. Part of the challenge is finding paint that has the best durability and most effectively holds onto the reflective glass beads it contains, while also meeting federal environmental standards for volatile organic compounds. Some of you might have noticed that pavement lines have become less visible, since oil-based paints were discontinued in 2010. (In fact, some of you have asked about the more worn lines). Stay tuned for the results, as the contestants in the line paint challenge show their stuff. 1) What were the results that you discovered? Has it been implemented yet? 2) How much do taxpayers currently pay for line painting and road reflectors (or “road technology” in general)? 3) How much is this new method projected to cost? 4) What is the decision-making process behind the implementation of these projects? Is market research involved? Take a look at Geveko Type 2 Thermoplastic markings for an idea on how to control water on road markings. A big part of night/rain visibility is the issue of water sitting on top of the paint reducing reflectivity. The above markings are applied in droplets rather than a continuous flat layer of paint so that the water can drain around the markings thereby allowing the glass bead paint to properly reflect headlights back to the driver. Has MoTI looked at application techniques or just paint type? We have usued this method of application for thermoplastic paint. Others include “Rainline” and similar raised – profiled or “drop on / spray applications for durables. We typically use the raised / profiled durables in high traffic high rainfall areas. The “flat” durables applications tend to be for X walks and what we call transverse markings. Thanks for your comment. Hi in the far west from the far east. I tried contacting Mr. Mike Pratt; however, it appears that the email address that I have; Mike.Pratt@gov.bc.ca is no longer active. Is there another email for Mr. Pratt and/or a new person in the Project Manager Position. I have a few questions relating to Paint Test Deck for asphalt road surfaces? Thank you for your time. Hello Ken – yup – that email address is incorrect. We have sent you the correct one directly to your email. Thanks! The toxic effect of a continuous line painted with a Volatile Organic Compound can be reduced if gaps in the line are located along the alignment. The reduction in toxicity is 90% if a two foot long strip of VOC paint is applied every 20 feet. If this process is superimposed over a continuous line of the paint currently used it would go a long way to solving the visibility problem. An alternate solution would be to install recessed Stimsonites more commonly known as “cats eyes”. They’re used effectively in many jurisdictions but like most things require maintenance. Occasionally a water truck might need to be dispatched to flush out debris. The goal is to save lives… can’t the ministries of Environment and Highways resolve this issue between themselves? We shared your comment with our Manager, Maintenance Programs and he informed us that we are replacing the earlier types of low VOC & WB with paints with more resistant resins and tougher glass beads. The new low VOC and water borne paints are now just as good as the older high VOC content alkyds. The problem of higher wear is, in a large part, the result of more freeze thaw cycles, more studded tires and higher traffic volumes. Ultimately though, the solution is the durable line marking material, which we are adding to high traffic areas at the cost of $2 million per year. The idea of intermittent different type of paint every 20 feet could create a line that appears to be a dashed line when what is required is a solid line that is intended to keep traffic in its lane. We do use raised reflectors that are slightly recessed into the road surface to protect them from plough damage but it is still a challenge to have them last a whole season. Hope that this helps! Your comment … “ The new low VOC and water borne paints are now just as good as the older high VOC content alkyds ” implies the environmental problem of toxicity that resulted in the discontinued use of the paint product used prior to 2010 has been solved and an effective retroreflective paint is now available for use. We used the new higher quality WB paints in several areas last summer & fall and they have done well. The next step is to get them into wider use through the new line marking contracts being issued this summer to be in place by December 2018. Hi its really difficult to follow the traffice lines here in vancouver especially when its raining. Now that its starting to rain. I really have difficulty driving. I asked my colleagues and friends and they experienced the same. Back in our home country(3rd world) they have paints that reflects and very visible even on rainy and wet conditions. Just wondering why here in Canada you havent used it. Is it something with the chemicals on the paint? I hope you’ll find a way to have the lines more visible or reflect. Thanks for your comment. Oil based paints were discontinued in Canada in 2010. Part of our challenge since 2010 is finding paint that has the best durability and most effectively holds onto the reflective glass beads it contains, while also meeting federal environmental standards for volatile organic compounds. This is why we are observing recently painted test lines and collecting data, to gain a better understanding of how the paints perform over their typical life cycle. Hope that this helps. I am with the Department of Transportation and Works with the Province of Newfoundland and Labrador and I am very interested in how this project was set-up, what you have found to-date, etc. Would it be possible to have someone contact me or let me know who I could contact to discuss? Yesterday drove at night for the first time the section of Highway 1 west of Revelstoke since the posts with reflectors were installed. They will certainly help when the road is snow covered, although the are only on short sections (not even all curves). Are there plans to do the same on more sections of the highway? Unfortunately, I suspect the ones under the Three Valley bluffs won’t survive snow removal after avalanche control. We sent your question to the folks in the area and they told us that the ministry will continue assess locations across the province where roadside reflectors could improve safety and install them as funding becomes available. Hope that this helps! Thanks for your comment. We have shared it with our traffic engineers for review. You’re certainly correct Nick that roadside delineators take the full force of winter in our higher mountain passes. We work hard to install and retain roadside delineation to aid drivers in navigating the roads during winter weather. Our shoulder rumble strip program continues to apply this safety tool to new locations in the province. During winter conditions they can certainly assist in keeping within the traveled portion of the road. Thanks for connecting with us here. Don’t get fool by TranBC. They will never fix this problem, if they do those workers will lose their job. They are just stealing our tax money. I ask simple question like “why do you guys need to test materials??? when rest of the world has already tested and using better line markings? ?” but they forwarded me to this page and not getting answer for it. Alaska has worse condition or equal weather condition as BC, some of the european countries have similar or worse condition, but they do have better road markings. “Research”, don’t get fool by this word. If they stop this “research” they lose their job. BC never gonna get better roads. I am student looking to analyze the various road marking materials for school. I am very interested in your test deck data. Will it be available? I am finding it very difficult to find any data relating to durability of markings in Canadian Climate. Any help would be much appreciated. We are still collecting data for this test but will be sure to share it with you as soon as we have it. I find it interesting that while Europe uses a white hot calcium liquid with ground glass for reflection, BC continues to rely on out dated basic line paint. The hot melt version is usually placed in a pre cut trench in the road surface making the installation not only permanent, but resistant to plowing and general road repair. Come on BC, lets move out of the stone age, stop painting the roads with pigments and use long life materials like those used elsewhere, Cost cutting? or Safety? Hello, this is a message for Will Lewis. Does your white marking system work on cement or only asphalt? I have developed all natural white marking system that is neither paint nor polymer, and will last as long as the pavement it is used on. It is not affected by sand, gravel or plows, and it’s application time is only slightly longer than painting. It is non-toxic, inexpensive, and will outlast virtually any other marking in existence. Had I known about the test, I would have loved to have submitted my system to prove its worth against surface markings. Will, I am interested in your paint, please contact me. 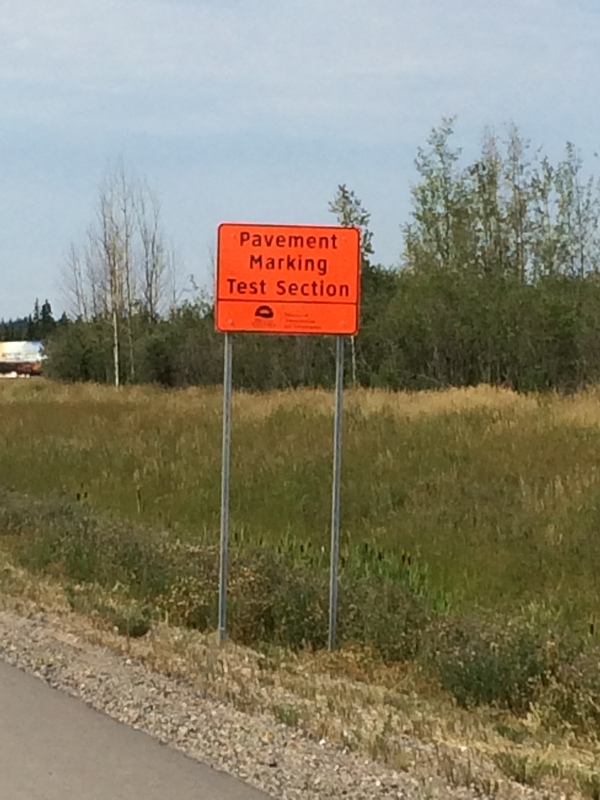 Great to learn testing is being done on BC Highways. It would be most appreciated if results of the testing are available and could be forwarded to me including the products tested, where the products were developed, were comparisons made with other cities/countries doing testing, etc. Thank you. We will share your email forward with the project team so they can inform you of the outcome of the testing. Thank you for connecting with us here! My family & I just had to drive in the dark to get home to Prince George from Kelowna due to a family emergency. Never again (at night) if I can help it! Overall, the road lines were atrocious and almost non existent in many stretches of road along highway 97 N! Center lines and sidelines were so faded. This made for a very very anxious and at times an unsafe drive home. I hope that communication occurs between the municipalities to ensure the entire road system is painted along highway 97. It seems some communities make this more of a priority than others. I look forward to hearing how the BC ministry of highway will ensure highway road painting to be made a priority and completed asap. I’m not surprised we have so many road fatalities along particular stretches of the BC road system I realize speed plays a huge factor but clearly marked roads (especially for the evening/night travelers) must also be a close second for cause. http://globalnews.ca/news/1819213/british-columbias-12-deadliest-highways. We are sorry to hear about your experience and we will share your concern forward with the local area manager. We paint the lines on provincial highways every year because the lines get worn through regular road use. This is especially true in the winter, with sanding, salting and plowing all doing their part to wear the paint away and make the lines less visible. Once the weather dries up enough, our road crews will be out in force re-applying a fresh coat of paint wherever it is needed. As you are aware from reading this blog, recent federal laws have meant changes to the type of paint we are able to use but we are working on a solution that will provide long lasting line markings across the province. Something is fishy….I was just at the coast recently and the line paint is far superior to what I see in the Okanagan. its thicker the brightness of the yellow is better. The color up here is darker. In my opinion it all comes down to cost, and I bet with you they are using the cheapest crap they can get…. We appreciate the concern over pavement marking durability. It is something all jurisdictions are working on a solution for. Unfortunately, line markings are very susceptible to wear from ploughing and the abrasion caused by vehicle tires on the road grit applied for winter traction. The lower mainland has a very different environment than our interior areas with less snow less ploughing or use of winter aggregates on the roads therefore much less wear on their pavement markings. All our line marking contractors use the same recognised products list which we share with neighbouring jurisdictions. Alberta, Washington State, Oregon and the NW Territories use the same list of recognised products we do. We share research information and testing results in our search for more durable markings. We share research information and testing results in our search for more durable markings. I hope that answers your question. Thanks for the link to this news article, but we don’t see any mention of different types of paint being used across the province? Hi there, just wondering if the reflective line paint was discontinued because of environmental concerns or cost? Saskatchewan continues to use the reflective paint on their roads and it stands up very well through severe winters and heavy salting, sand and gravel use. I do not see the reasoning behind trying to invent the wheel again, just look to our neighbours to the east to find what works. The roads across BC are nothing short of pathetic when it comes to driving at night and God help everyone if it’s wet out. Thanks for connecting with us here. Environment Canada regulations limiting the use of VOC alkyd (traditional) style paint came into effect September 2009 and those regulations applied to everyone in Canada, including BC and Saskatchewan. Part of the reason you might notice a difference in the lines found in BC and Saskatchewan is because weather and climatic conditions are very different between the two provinces. Snow in Saskatchewan is generally not as heavy or as wet as our coastal snows and many of their roads are elevated above the surrounding land resulting in the snow generally being blown off their highways. Traffic volumes are also lower in Saskatchewan and roads are straighter resulting in less crossover on the lines (tire wear). Climate during paint application also plays a significant role in its staying power; any paint application holds better when applied after a long hot dry spell. If waited for those conditions in BC we would risk cutting our re-painting season to 30% of what it currently is. The safety of the travelling public is our absolute priority and we continue to look for ways to improve line markings in BC. 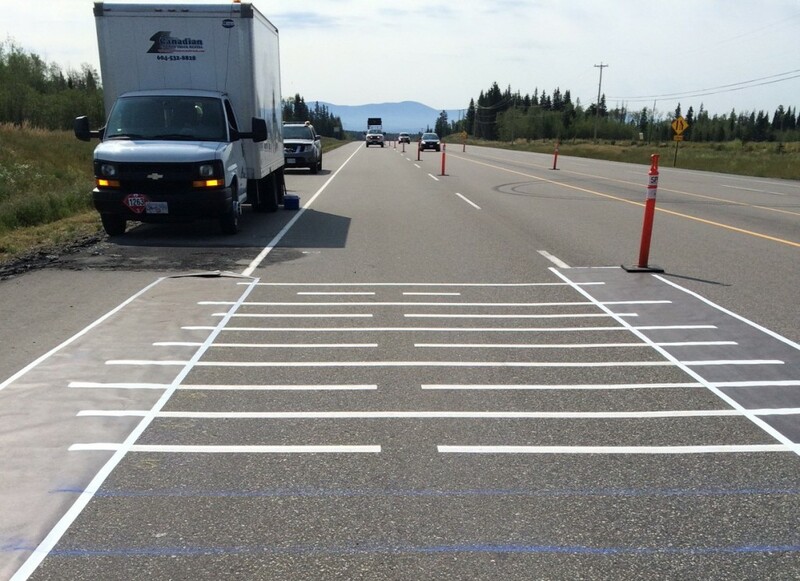 We are working with other jurisdictions to find better ways to maintain our roads and road markings and have invested in research to find more effective line marking materials for high humidity environments such as ours here in BC. Hope that this helps answer your questions. Why not try recessing the lines just a hair below the surface with a 4″wide grinding wheel,This way plow blades won’t touch the paint. You make a great point – recessing lines does make them last longer. However, the purposes of the test section is to monitor the paint to determine how long the products last in “usual” conditions. This is, of course, accelerated as vehicles are constantly hitting all of the lines in the test sections. We do recess the lines in some cases, especially when using a durable product to ensure it isn’t scraped off by plows. A drawback of grinding out the pavement to create the groove does compromise the integrity of the surface leading to cracks and so on. Hope that this helps! One of the things that comes to mind is how the paint will react given a temperature change. In some places, this is as much as a hundred degrees going from summer to winter. You have to know the chemical make-up of the paint to see if it will withstand such a vast temperature change. It is also important to get the lines painted by someone who knows what they are doing. You don’t want the lines to be crooked or out of place. Good points Sam, thanks for sharing. Rest assured we are looking at many, many aspects of the paint to determine which is the best. I’m glad something is being done b/c the color and lack of reflective qualities of the paint I am seeing in the interior is very bad. Add rain and winter sand, you litterly can’t see which lane you are in. I potentially have a solution using 2 component Polyurea, but would require testing and a certified contractor. A good point. Unfortunately, the federal government has banned the use of lead based paint which many of our past employees would have used. Stay tuned! On busy, narrow, winding, snowy highways (yes I do mean the Trans-Canada in the Mountains) you really need to use rumble strips far more than you do at present. Both on the centre line and on the fog lines. I very much doubt you will come up with a paint that survives the winter here but rumble strips will. Thanks for the feedback Nick – we will share this forward on your behalf. Is there somewhere in particular you are thinking? All two lane sections from Perry River (North Fork bridge) to the boundary of Glacier National Park (i.e. almost all of it). Thanks for this Nick. We will share your comment forward with the local area manager. Are you, or the Federal government, considering the emissions of vehicles pouring the paint? If you have to repaint more frequently then the vehicles’ emissions are multiplied for that time. Vehicle emissions could be as harmful for the environment (more or less?) than the toxins in the paint. You make a good point. We have forwarded your comment to the project manager and will let you know what we hear back. Stay tuned. I am more worried about the safety of line painting than emissions. A few years ago near Golden there was a fatality when a semi rear ended traffic when lines were being painted. More maintenance means more risk of an accident (something that needs to be considered in other ways – e.g. lane closures on multi-lane highways are much less hazardous than single laning on winding 2 lane highways – especially when they are as busy with heavy traffic as the Trans-Canada). Part of the issue is that the new low-VOC paints blend in with the road texture. This also means that they are not being applied thick enough which leads to premature wear (less than two years to completely clear pavement on some parts of the PMH1 project) and causes the lines to disappear in to the road surface at night and especially in the rain. Thick, raised paint will make a massive difference to road safety. Right now we are all driving and simply guessing where the lanes are at night in the rain. Good news! I have been concerned for a few years now since the highly reflective line paint was discontinued. Maybe with the outcome of these tests we might get something back that will make our roadways a little safer once again. Frankly when driving the canyon or highway 1 west of Hope on a rainy winter night with semis speeding by throwing up tons of spray its a wonder there are not a lot more incidents. Thanks fot tis, lets hope we get a good product out of the testing. Thank you. I would also ask that the grip be tested in the wet. I ride a motorcycle year-round (not in the snow or on potentially icy days) and I am very concerned about losing traction on the lane dividers. It’s concerning for cars but deadly for bikes—bicycles included. Thanks for touching base with us about the grip-ability of the new paint. We will share your comment forward with the project manager.